V.com weekend vote: Do you ever play violin or viola while wearing earplugs? February 8, 2019, 10:12 PM · Hearing is especially important to a musician -- but as violinists and violists, several factors can work to damage our hearing. One problem is the fact that the instrument sits so close to our left ear, feeding it an excess of sound for long periods of time, even when we are just practicing. And another problem is that when playing in orchestra or in a band, we can can be subjected an earful of very loud noise from other instruments or from amplification systems. One solution is to wear earplugs when playing, something that I've certainly done during loud pops gigs. 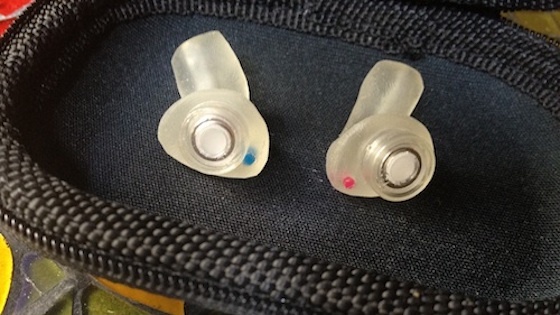 Very often if a concert is particularly loud or amplified, the orchestra will provide conventional foam earplugs backstage to anyone who wants them. A number of years ago I took matters into my own hands and saw a doctor who could set me up with custom earplugs by a company called Etymotic. These were developed specifically for musicians in the Chicago Symphony, by a doctor named Mead Killion, who also just so happens to be an amateur violinist. These earplugs attenuate the sound, so you hear all the same things, just a lot softer. They must be fitted to your ear specifically, as they fit in there like a hearing aid. I have found earplugs to be a lifesaver during loud gigs, and I've also occasionally used them at home for practicing, though using a mute also can work. But with the musician earplugs, it is possible to practice and still to hear what you are doing! What are your experiences with playing with earplugs? Is it something you have ever done, and it what situations? Do you ever use earplugs for practicing? Or perhaps even just an earplug in the left year? (You can vote "yes" if that is what you do!) Please participate in the vote and then share your thoughts about hearing protection and the use of earplugs. February 9, 2019 at 07:19 AM · Everything everybody says about wearing ear plugs makes absolutely perfect sense, but I never do it. It feels like I'd be ruining the personal playing experience somehow--I await to be told by others that with modern ones this is wrong! I did very recently have my hearing checked by a medical specialist because I suspected my hearing is fading and I have a history of this on my father's side of the family. I never abused my ears with loud rock music in my youth, but I did work in my early 20s on a loud rifle range with no ear protection. Anyway, I have signs of some genetic loss, but I am still in the normal range for my age (62). The doctor did not think based on the evidence that I had any losses from playing. So I guess all the years of the violin under the ear and all my orchestra playing have not damaged me. February 9, 2019 at 08:08 AM · I really do need to use hearing protection, over-the-counter musician's earplugs, or else the sound distorts and overwhelms my hearing. I have no reason to be surprised by this. I've used a decibel meter (phone app) to measure the sound pressure for my violin(s) at distances equivalent to the distance to my ears, and 100 decibels is common, while peaks can reach 120 decibels. There's simply no denying that it's loud. It's a bit disheartening too. I can set up a microphone at two to three feet above my violin and monitor the sound through headphones, and it's beautiful. But I have to "distance" myself from it by that means, or by earplugs. But so be it. I worked in trades for most of my life, printing plants and cabinet shops, where the machinery is loud enough to damage hearing over time, but I always wore over the ear protection and I guess it paid off. I had my hearing tested recently and found that it's about ten years younger than typical for a person my age. Even if you can tolerate the sound pressure from your violin, the math suggests that it will be harmful over time, and I'd recommend that you consider musician's earplugs. February 9, 2019 at 11:30 AM · I started wearing Earrasers about two months in to picking up a violin for the first time and discovered an unexpected, positive effect on my bowing. Without the earplugs, I couldn't get myself to override the beginner's "squeak and scratch avoidance" syndrome resulting in timid, on top of the strings bow slithering. Of course the left earplug didn't, itself, fix my bowing but it sure made it much, much easier to explore the weight of my bow arm. As a fledgling second violin in my community orchestra, I sit just in front of the trumpets. I think wearing an earplug is a no-brainer, I'm apparently the only one in my vicinity who does. Go figure! February 9, 2019 at 12:57 PM · I have some hearing loss in both ears and need to wear special filtered ear plugs to protect from further loss. This is fine for practicing and playing chamber music, although I had to get a louder metronome for practicing viola because I could no longer really hear the beats on the older one with my earplugs in. However, the ear plugs are a real problem for orchestra. I have trouble hearing the other violins and some of the other strings and no longer catch all the cues I have relied on. All the strings sound as if they are playing with mutes. I am going to have to call my audiologist to see if there is anything I can do. She already had my earplugs slightly redone to try to deal with that problem, but her efforts were only somewhat helpful. February 9, 2019 at 01:38 PM · I wear non-custom musicians earplugs by Etymotic when I practice. My violin is particularly loud and I’ve always worn hearing protection or use a mute when I practice. For lessons, I forgo the earplugs and mute. February 9, 2019 at 01:45 PM · There are days when I feel the violin is too loud but then I play with a mute. February 9, 2019 at 02:27 PM · I like Mark's idea of hanging a microphone a few feet above my violin and listening with headphones. February 9, 2019 at 02:34 PM · I have worn both Etymotic and Vater musician earplugs (not custom) since I returned to playing as my previous violin was very loud under my ear. I prefer the Vater plugs - from what I understand they were originally designed for drummers. In any event, I use them for practicing and my ears do not ring afterward. My current violin is less loud under the ear, so I can practice for fairly long periods without the earplug, but I feel it is healthier for my hearing to do so and continue the practice. The pro musicians that I know do not practice with ear protection. February 9, 2019 at 02:35 PM · I always use foam earplugs, L/R, decibel factor: -33. I can get 10 pairs at the pharmacy for about $5 USD. I started this routine some years ago, when I first played on Thomastik's Infeld Red strings, A-D-G, on one fiddle + steel E. These were noticeably more powerful than the wound-gut types I'd used before. Ever since then, I won't practice or play without earplugs. The sound I get with plugs is more like what I'd get from listening to someone else play 10-20 feet away from me -- and it doesn't sound too different from what I get on playback. One reason I decided, at 21 y/o, to quit doing orchestra is that the high decibel levels of some modern symphonic pieces got on my nerves. This is the effect loud noises have on me -- they are intensely annoying, even well before they reach the danger zone. I hear and see many orchestral performances throughout the week -- albeit via YouTube, not the concert hall. So I can control the volume settings to suit my own preference. Still, part of me winces when I think what the players on stage must be going through during the loudest parts. February 9, 2019 at 02:40 PM · I always use a cottonball in my left ear. Sometimes high notes hurt my other ear as well, but I need at least one open (definitely when peforming). February 9, 2019 at 03:37 PM · I used an inexpensive wax earplug in my left ear in my 50s to balance the hearing in both ears. Without the plug in my left ear that ear was over-driven causing it to hear sharp resulting in my playing flat. I am not the only violinist to have had this problem. That was over 30 years ago - my hearing has gotten worse and now I wear hearing aids and my ears are balanced. I actually tried the left-ear hearing aid on the entire violin section of our orchestra and it instantly improved section (1st & 2nd) intonation. February 9, 2019 at 03:52 PM · Nice timing, I went to a concert including Elgar's second symphony yesterday, every time the trombones came in I felt pain. I remember a mooc I did on conducting, it recommended that every musician have custom made earplugs with a choice of filters so you can cut out as much as you want. February 9, 2019 at 04:42 PM · I started wearing a foam earplug in my left ear for practicing several years ago. I don't do it all the time, but I find it cuts out a lot of extraneous noise and helps me be able to concentrate on pure pitch. My teacher told me that my intonation improved after practicing with the earplug. I have special trouble hearing pitch in the gerbil zone on the E-string, and the earplug really helps with that. I was first inspired to try the earplug after talking with an 85-year-old lady who was in my orchestra. She had been playing the violin for 80 years and was almost deaf in her left ear. She attributed this to having played the violin for so long. She could still play because the hearing in her right ear was ok. I then discovered the happy effects of the earplug on intonation and incorporated it into my practice routine. I bought some fancier earplugs aimed at musicians recommended by my orchestra conductor to wear during loud rehearsals and performances, but I don't find them very comfortable so I only wear them if I know the brass is going to be blasting away. The violas are pretty close to them and although I don't find it particularly painful, I want to protect my hearing and still be playing when I am 85. Otherwise I have a hard time hearing the other musicians if I wear earplugs and would prefer to not wear them during orchestra or chamber performances if I can help it. February 9, 2019 at 05:15 PM · Loud amplified pops shows only but for those, earplugs are a necessity. February 9, 2019 at 05:20 PM · This is one of several little issues that went away unexpectedly when I went electric. February 9, 2019 at 06:16 PM · I always play with a -12db Earsmart musician earplug in my left ear. If I don't I always end up with tinnitus and deafening in that ear afterward, and this can't be good in the long run. In the orchestra, I sometimes have to also wear the right one, especially when sitting in front of the flutes or the piccolo. I rather not wear it if I have a choice as it gets difficult to ear myself and others in the section, but with the piccolo it is almost survival! Those playing first violin section never have to experience that and are lucky that way. February 9, 2019 at 06:26 PM · After a lifetime of being down-wind from trumpets, piccolos, and also doing snare drum, black-powder shooting, I now have expensive, computer controlled hearing aids on both ears. For playing violin I only use the left one, on Music setting. My loudest band, a very long time ago, was the Don Ellis band. Fortunately, my spot was on right edge of the stage. I used an ear plug in the left ear, I could hear myself through the bones in my head, and the rest of the band from sound bouncing from the back of the hall. I recommend some kind of ear plug in the left ear for everyone. For students, with cheap or bright instruments, often using steel strings, they can be inhibited by the harsh sound. February 9, 2019 at 08:13 PM · I have the Sonica earplugs that advertised to have -23dB noise reduction. I usually put one on my left ear to protect me from my violin. Usually my orchestra session is not very long nor very loud (so far), so I leave it out but have it ready just in case. February 9, 2019 at 08:24 PM · Paul Deck, I didn't mean to imply that hanging a microphone above my violin and listening through headphones was a viable long term solution to anything. Just that it allows me to sample my sound as others might hear it. And for everyone, I wanted to point out that the earplugs I use, D'Addario "Pacato," can be inserted into my ears to a greater or lesser degree to vary the effect from minimal attenuation to the -12dB rating. Since many other plugs are very similar in design, I would assume that they also can be varied in this way. You can have just the attenuation you feel you need. February 9, 2019 at 08:55 PM · I voted that I usually wear earplugs when I play, but this isn't fully true. I wear a conventional foam earplug in my left ear only during practice (not during lessons or performances) because I feel like my violin kind of screams in my left ear during loud passages. When I eas younger, I did not need an earplug during practice because the small violins I used weren't loud enough to cause potential hearing damage. I only started using earplugs when I moved up to a very nice and powerful 3/4 violin and I now use a 4/4. I also wear a conventional foam earplug in my left ear during symphony orchestra rehearsals and performances because the winds section can be loud at times, but I never use earplugs for string orchestra or chamber music. February 9, 2019 at 08:56 PM · Wait, I forgot to mention that I don't like using practice mutes because they seem to change the sound in a way I don't like. The earplugs I use don't effect my ability to hear things clearly, partly because I only wear one in my left ear. February 9, 2019 at 09:30 PM · I tried using earplugs once in my life: last year, an orchestra I was playing in handed out earplugs for one gala concert with a lot of brass on a small stage. I wore them for the sound check, but decided to play the concert without them because I couldn't get used to how everything sounded with the earplugs in. February 10, 2019 at 01:40 AM · This is such an important topic! Thanks for making this a topic. Hearing damage among professional musicians is extremely serious and very common (30-60% of all professionals will develop it in their lifetime according to the scientific papers). Hearing damage is caused by unsafe noise exposure. Suffice it to say that if we were to follow both OSHA laws and NIOSH advice, musicians would be wearing them a lot more than we are. So, when I am playing just by myself for a short time, I wear nothing. If I am practicing a lot, I wear a 12db ear plug in the left. If I know I'm going to have rehearsal later I definitely wear left when I'm practicing. As many other have mentioned noise exposure to other instruments in the orchestra is particularly dangerous. If sitting near pic, brass, and percussion significant ear protection in both ears is warranted (more than 12db). So wearing earplugs should be tailored to the experience of the day in terms of db level, distance (and room that you are playing in) and length of time. Pops is an obvious one for significant protection. Sorry to get all science heavy, but I found that knowing the facts really helped me make better decisions and experiment with different ear plugs. It's nice to hear yourself "au natural", but it's not worth it if it means developing hearing loss, tinitus, or hyperacusis in the long run. February 10, 2019 at 02:27 AM · I've worn earplugs in bed for about 25 years as I have very sensitive hearing and am a light sleeper. I never wear them while playing. When I went violin shopping a couple of years ago, one of my criteria was that the instrument didn't hurt my ears. All sorts of beautiful instruments were instantly dismissed because they caused pain, particularly on the E string. I was lucky enough to find an instrument that sounds like honey under the ear, but projects to the back of a hall without too much effort. February 10, 2019 at 02:29 AM · My partner who plays violin, had a hearing test recently. Here in Australia they only test the hearing range which is relevant to speech sounds, so all sorts of frequencies relevant to musicians are ignored. Therefore my partner's hearing test was not helpful at all for the music-making part of his life. February 10, 2019 at 03:33 AM · They must have audiologists in Australia who can test the full range of your hearing. February 10, 2019 at 04:08 AM · --Robyn; "they only test for...speech sounds"?! That's odd. It is the upper octaves that are necessary to distinguish the different consonants; s,t, ch,k, etc. and it is those same upper octaves that are damaged first. Susanna -- thanks for the science. The distance factor is even more important than we think, because the intensity obeys the inverse square law. think of an expanding sphere. Our left ear is only a few inches from the top plate of the violin. February 10, 2019 at 05:31 AM · Never when playing violin, but always when playing guitar or drums at full band volume. February 11, 2019 at 02:50 AM · Paul, this was a GP referral so probably more of a screening. My partner would have told them he had concerns about his hearing at DB ranges that go beyond speech. Joel, an orchestral musician likes to be able to hear the basses as well. He can't hear certain low frequencies also, meaning he is not troubled by my neighbour's subwoofer, so it's not all bad. February 11, 2019 at 02:59 AM · By the way, the Hearos Xtreme are 33 Db protection, I believe. Interestingly, I can actually hear myself BETTER in orchestra in loud passages when wearing earplugs in both ears, because I can really hear my own pitch through the vibration in my jaw. Strange but true! February 11, 2019 at 05:51 AM · I should wear them during practice. I was used to with rock band, every time on rehearsal and concert, noises are mad today. Many clubs are driving volume to extremes. Our band asks many times for less volume, but it is a bad trend. I don't like it even because it dulls your ear. It saturates hearing by volume and your sensitivity is gone. I was unable to recognise 5 cents and after 20 minutes even 30 cents in high volume. And this is what I hate. It is stupid. I should wear them regularly during my practice. I have Vater earplugs (it is drummer's company but these are for musicians, not just drummers). February 16, 2019 at 02:45 AM · I have a problem with intonation. I can not hear it while I am playing but when I listen to playback I am acutely aware of any problems with intonation. Any suggetions?